easy-guard Fire Upgrade Paints were designed in conjunction with (Exova) Warrington Fire and fully tested to BS476 (Parts 6 & 7). These intumescent, fire suppressing coating systems prevent flame spread in communal areas and are available in either a 3 coat, high build intumescent layer, “Class 0” system or a 2 coat, Fire Upgrading Paint, “Class 1” system. Under testing both performed exceptionally and are certified prevent and repress the surface spread of flame whilst safely encapsulating potentially flammable paint layers. 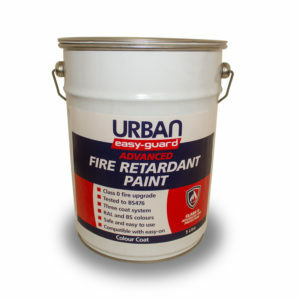 easy-guard fire upgrading paints are manufactured using only the very highest grades of intumescent paint additives, pigments and binders. These water based and solvent free Class 0 and Class 1 paint systems are easy to apply and 100% tested and compatible with easy-on anti-graffiti clear glaze coating. The application of which will result in a graffiti resistant, 20-year life, fire upgraded wall. Please call us for advice about your communal areas or with your fire upgrade questions. A fire safety expert will be on hand to take your call.